This week, Portia and I hosted two runs in London of the “Business Value Game” that Vera and I developed. As usual, we had a lot of fun hosting the session and got good feedback from the participants. Portia started the Brain Train sessions as a way for friends and colleagues to get together to experiment with new sessions and games. 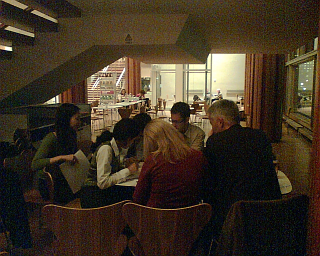 Earlier this year, we presented the “Real Options Space Game” at a Brain Train session in the Royal Festival Hall. 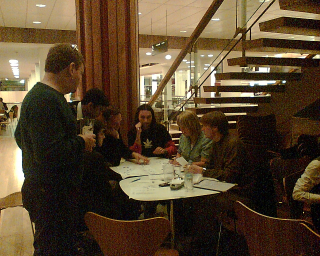 Last Monday we were back in the friendly lobby of Royal Festival Hall. As players started trickling in we grabbed a few tables and chairs to set up the game. Portia and I each coached one team through the six iterations of the game. Each team used different strategies. For example, one team lost an unhappy customer because they concentrated on the other more lucrative customers, while the other team ensured that each customer stayed happy. In the end, Portia’s team won, even though they lost a customer. After the game, we held a retrospective to see the good, the bad and the puzzling. The participants learned (or confirmed) some lessons about customer interaction, iteration planning, release planning, communication and teamwork. We’ll publish the results of the retrospective. Thank you Eamon, Roshni, Jenni, Mark, Ioana, Al, Mohan, Daniel, Dot, Tamas, Eben, Ashutosh, Archie and Maria for playing and giving feedback. The next day, I attended the first day of the Agile Business Conference. The highlight of the program was a funny and energetic keynote talk by Rob Thomsett on Agile Project Management. One of his learnings is that when we borrowed engineering and construction project management models we also inherited their prevailing culture. The relationship between “IT experts” and “Users” (a denigrating term) has always been adversarial. Open: full participation and ownership by stakeholders. Trust: team members and stakeholders are professionals who can be trusted to be committed to the project and the organisation. Honesty: all people impacted or involved have a right to be told the truth; asking for help is a sign of strength. Courage: Undertaking projects requires courage in many areas like telling the truth and asking for help. Money: projects consume money. This requires a fiscal and ethical responsibility to be shared by all team members and stakeholders. Rob concluded with some of concerns (silver bullet syndrome, lack of whole-of-life view, focus only on technical issues, lack of cultural awareness) and drivers (faster delivery, change friendly, more enjoyable, real teams, great values) of further Agile distribution. In between sessions I talked to some acquaintances and met some new people. Together with Exoftware (thanks Andy! ), we invited people to come to the next day’s Business Value Game. By then, we had already updated the game with the feedback from the Brain Train tryout. one of the teams used some extra time to come up with elaborate strategies and tried to make decisions before they had all the information. one team discarded information because they felt they didn’t have enough time to examine the information. All teams could have done better and worked faster if they had shared more information in the team and if they had only taken decisions when they needed to. But that’s the subject of another game, the “Real Options Space Game“. One of the highlights was seeing Ole and Jenni from GoAgile in Denmark again. Thank you for the gift and the great conversations about sessions, presentation techniques and Agile project management. We still owe you an explanation of Real Options. Most of all, thank you for your enthusiasm. The conference closed with a presentation on the “Responsibility Model” by Christopher Avery. Chris explained the difference between being given accountability and taking responsibility. His model explains how we typically react in the face of problems. Portia has a good writeup of the material. On the way back Portia and I had a lot of fun going through each of the steps in the model in an exaggerated way, because one of the “Keys to Responsibility” is Awareness of how we (re)act. We got good feedback on the game. Portia, Vera and I are busy working on v2.0 of the Business Value Game. 11-12/12/2008 – XP Days London – London – The Real Options Space Game and a new game by Vera. Exciting! Or you can download our games and play them at home. Watch this space for the release announcement or come and play with us at one of the upcoming conferences and seminars. This summer, I met two of my heroes, Eli Goldratt and Neil Armstrong, in Paris. Yesterday, I met another hero: Daniel Dennett. Professor Dennett gave a talk entitled “Considering Consciousness” at Antwerp University. Professor Daniel D. Hutto provided a counterpoint to the presentation. Dennett used the metaphor that “Consciousness is Fame in the Brain”. Lots of stuff is going on all the time in our brain. Information is changed, updated and revised (the “multiple drafts” model), distributed in time and space. Some of this activity wins a competition for attention and becomes “famous”. That’s when we become conscious of the activity. We can make a clear distinction between conscious and unconscious, but we can’t pinpoint an exact time when something becomes conscious. A thought becoming conscious is like a “speciation event” (the start of a new species): the moment when it happened only becomes important in retrospect. An observer who was there at the moment it happened wouldn’t notice anything very special. Consciousness isn’t an all or nothing phenomenon. Are animals conscious? A lot less than humans. Is a baby conscious? Less than an adult and in a more limited way. As it grows it becomes more conscious and conscious of more. Dennett warns us against the seductive “Cartesian Theater”, the idea that there is some special place (and time) in the brain where consciousness exists. As if there is some homunculus in the brain that is conscious and that watches and controls all the unconscious processes. But then, how can we explain that consciousness in terms of unconscious processes? We’d be stuck in an infinite regress. Subtle versions of this idea are very common. Another common fallacy is to confuse the time of the represented with the time of representing. For example, when we hear the sentence “Bill arrived at the party after Tom”, we will first represent Bill, then Tom. But our representation indicates that Tom arrived before Bill. Our mind has clever tricks to deal with time-related issues. Signaling and processing in our bodies and brain is rather slow, so our brain will adjust the ‘timestamp’ of information received by taking into account the expected ‘travel time’ of the signal. Neurological experiments can exploit this adjustment so that it seems to the subject as if actions happen before they’ve initiated them. When Dennett explains these fallacies, they seem pretty obvious. Yet, only a few months ago I read an article by a philosopher who claimed that a neurological experiment that ‘cheated’ the brain into thinking that actions had been performed before they had been decided showed that people have no free will. More on free will later. Heterophenomenological Method is a big word to describe a method of enquiry where when someone tells us “It feels like <this> is happening in my brain” we certainly accept that this is how it feels. That doesn’t mean it actually happens that way. Another metaphor: when we investigate consciousness, we should act like a Martian investigator, looking for the objective mechanisms behind the subjective report. Daniel Hutto questioned, with a presentation on the edge of “Bimbo slides“, whether Martians could really investigate us if they were devoid of a human body like the Martians in Wells’ “War of the Worlds”. Is the Heterophenomenological method really feasible? Hutto proposed to relax the requirements, because experience is crucial to understand. Another question that arises is: what is “I”? Where is it? Is it the conscious part of me, like the Cartesian Theater would suggest? Or is the I more encompassing, including unconscious processes and the body? I know how it feels it works. This summer, in a discussion about heroes, I realised that the people I admire have one thing in common: they’ve made me see things in a different way. Finally! We have a velocity! One of the teams I coach is getting close to their first release using Agile methods. Our first planning and estimation effort was difficult because we had no previous stories to compare with and no kown velocity. So we had to estimate what our velocity would be. Not a very comfortable position, but what can you do if you have no historical information? It turns out that our estimate was not too far off. We didn’t give a “point estimate”, one date. We gave a range of dates between a “best case” and a “worst case” scenario. The size of the range between the two dates indicates our uncertainty about the estimates. We’ll probably deliver a few days before the “worst case” date, which is an acceptable date for our customer. Our releases are not timeboxed, they are scope-driven. The next release should be easier to plan and schedule now we have a velocity and a set of implemented stories. The next release isn’t very large. In about an hour we wrote the stories and estimated them. We reused many of the existing stories. We estimated the stories in story points by comparing them with the existing stories. This release will be about one third the size of the previous one. We know our velocity, therefore we know how many mandays we need. We know how many men and women are available for the project and when they’ll be available, therefore we know when we’ll be done in the best and worst case. This one will go faster! When we calculated the number of mandays, the developers exclaimed that this number was too high. They argued that their velocity would be higher on this release because they wouldn’t have all the startup costs of the first release. They were now more experienced. Maybe we’ll have lower startup costs. Maybe we’ll work faster because we have more experience. If we do, our burndown will tell us soon enough. It would be nice to end up closer to the “best case” than the “worst case” estimate this time. In any case, we need some time to clear out some ‘technical debt’. We’ve decided to invest 10% of our time in debt-reducing work. IF we deliver sooner than expected we’ll take on the next release sooner than planned. There’s more than enough work waiting to be done. And next time we’ll schedule using our improved velocity. People tell me that all the time. But if it was so easy, why did this person need to repeat their message for years? Why wasn’t the message heard or acted upon? Giving advice isn’t easy. Getting advice is even harder. The Secret of Consulting is that you have to be heard to have an effect. Everybody who wants to be heard, not only consultants, should read this book at least once per year. But, why does this customer need a consultant if their employees could give them the same advice, essentially for free? Why don’t they hear? Everybody who wants to hear, not only consultants, should read this book at least once per year. I hear a lot of talk about “Lean”, including at this customer. When asked about it, most people will say something about “eliminating waste”. Some may even mention “Japanese”, “flow” or “quality”. Real Lean is making use of the collective wisdom of everybody in the organisation. Real Lean companies don’t need consultants. Everybody’s a consultant in a Real Lean company. No matter how many books you’ve read, your advice will be neglected, misunderstood or mis-applied some of the time. Or, more likely, you will give the wrong advice at the wrong time to the wrong person. There are no perfect consultants. There are consultants who work on easy problems most of the time. Some of the time, in some places, significant change happens – especially when people aren’t working hard at it. (Weinberg’s Law of Twins Inverted). Everybody who wants to hear or be heard should read The Secrets of Consulting at least once per year. I’ve just started re-reading it. I rediscover at least one gem on each of its 200 pages each time I read it.